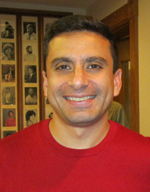 Home > Departments > Faculty > Esteban Cardemil Ph.D.
Dr. Cardemil received a B.A. from Swarthmore College in 1993 and an M.A. and Ph.D. from the University of Pennsylvania in 1994 and 2000, respectively. He was subsequently at Brown University, where he completed his predoctoral internship in 2000, followed by a postdoctoral fellowship. He has been at Clark since 2002. Dr. Cardemil's research focuses on understanding and addressing the mental healthcare disparities in the United States that continue to disproportionately affect individuals from low-income and racial/ethnic minority backgrounds. His research program includes both applied and basic research that lie at the intersection of cognitive-behavioral theories, prevention science, and cultural and contextual approaches. Current research projects take place in the local community and investigate the effects of culture and gender in a variety of contexts, including middle-and high-school urban children, Latino families, and the help-seeking process. In addition, Dr. Cardemil has written about the incorporation of considerations of race, ethnicity, and culture into psychotherapy practice and research. Cardemil, E.V., Edwards, L.M., *Nelson, T., & *Loyo, K. (2018). Cognitive-behavioral models, measures, and treatments (CBMMT) for treating stress disorders in Latin Americans. In Chang, Downey, Hirsch, & Yu (Eds. ), Treating depression, anxiety, and stress in ethnic and racial groups: Cognitive behavioral approaches. Washington, DC: American Psychological Association. Cardemil, E.V. (2018). Diversity and Inclusion: The gap between assessment and creating an inclusive campus. In S. Gertz, B. Huang, & L. Cyr (Eds. ), Diversity and Inclusion in Higher Education and Societal Contexts: International and Interdisciplinary Approaches (pp. 271-284). Palgrave MacMillen: New York. Cardemil, E.V., & La Roche, M.J. (2017). Introduction to the Special Issue on Evidence-Based Practice with Latinas/os: Attending to Heterogeneity. Journal of Latina/o Psychology,5(4), 243-247. *Moreno, O., & Cardemil, E.V. (in press). Religiosity and wellbeing among Mexican-born and U.S.-born Mexicans: A qualitative investigation. Journal of Latina/o Psychology. *Moreno, O., & Cardemil, E.V. (2018). The role of religious attendance on mental health among Mexican populations: A contribution toward the discussion of the Immigrant Health Paradox. American Journal of Orthopsychiatry, 88(1), 10-15. *Pollastri, A. R., *Raftery-Helmer, J. N., Cardemil, E. V., & Addis, M. E. (2018). Emotional expressivity and social adjustment in adolescent males. Psychology of Men and Masculinity, 19(1), 69-77. +Shahid, N., *Nelson, T., & Cardemil, E.V. (2018). Lift every voice: Exploring the stressors and coping mechanisms of Black college women attending predominately White institutions. Journal of Black Psychology, 44(1), 3-24. *Keefe, K., Cardemil, E.V., & +Thompson, M. (2017). Aftercare engagement: A review of the literature through the lens of disparities. Psychological Services, 14, 87-101. *Moreno, O., *Nelson, T., & Cardemil, E.V. (2017). Religiosity and attitudes towards professional mental health services: Analyzing religious coping as a mediator among Mexican origin Latinos in the Southwest U.S. Mental Health, Religion, and Culture, 20(7), 626-637. *Nelson, T., Cardemil, E.V., & +Adeoye, C. (2016). Rethinking strength: Black women’s perceptions of the ‘strong Black woman’ role. Psychology of Women Quarterly, 40, 551-563. *Reigeluth, C.S., Pollastri, A.R., Cardemil, E.V., & Addis, M.E. (2016). “Mad Scared”: Emotional expression and response in urban adolescent males. Journal of Adolescence, 49, 232-243. Denton, E.D., Shaffer, J.A., Alcantará, C., & Cardemil, E.V. (2016). Neighborhood matters: The impact of Hispanic ethnic density on future depressive symptoms 1-year following an ACS event among Hispanic patients. Journal of Behavioral Medicine, 39, 28-40.